Argh. The story about Dame Diana seems to be behind a paywall. Did anyone watch A Christmas carol goes wrong? Diana was the narrator, though she was heard more than seen. What did you all think I was a bit disappointed after the brilliance of Peter Pan goes wrong last year. This type of thing, which is more or less sending up the perils of amateur dramatics, only works when it is itself performed on stage in front of a live audience, which Peter Pan was last year. Subsequently, the narrator of that one, David Suchet, had a much more involved role. This year's pre-recorded offering was on a film set rather than a stage, and was far too slick and contrived. Yeah, it sadly didn't work as well as Peter Pan Goes Wrong. It was pretty much supposed to be an as-live production but it was an awkward conceit to pull off. It still had some laugh out loud moments as they're very good with the physical comedy. Diana running down Derek Jacobi did amuse though. I did find the running gag with the young actor who didn't know his lines, and reading them from various part of the set, quite amusing. This should really have been on a stage though. They are a very inventive team though, so hopefully they'll do more stuff in the future. Lovely interview with Diana I found today. I saw this yesterday. It's a very charming interview with Dame Diana. She's very funny in it. I think she might be mis-remembering the ice rink driving sequence in On Her Majesty's Secret Service however. They were still in the rear-screen projection period in 1969, and she was probably just on a set with a mocked-up car. And I seriously doubt they would have allowed her to do the stunt driving shots filmed from outside the car. Yes, but why would she misremember having done that kind of driving? I mean, it's a race with a bunch of other cars on an ice rink. That's not exactly your average spin down to the store or to the beach. If you look closely at the clip, it's also pretty clear that the interior shots of her driving seem not to have been filmed against a screen, and according to documentation in the Ultimate Edition DVD, Rigg and Lazenby did do most of their own driving during filming. Clearly, you're deliberately being adversarial and making up perceived insults against Diana Rigg that are simply not happening. "Mis-remembering" does not mean lying or making up stuff. I'm not insinuating anything. You are simply putting words in my mouth. And there is no sexism in my statements either. You are inferring something that is simply not there. I'm in my fifth decade and already early memories are starting to drop out the back of my head despite having had a near eidetic memory all my life. The events of On Her Majesty's Secret Service happened almost 50 years ago, and people's memories often conflate various events as they get older. In fact, the very nature of human memory makes this impossible to avoid. Each time you recall a memory, it is like taking out a file, copying it onto a new file and putting that new file back in the place of the original one, allowing for modification of the memory in the process. I could be wrong and this might have been the exception to the usual rules, but almost no one did their own stunts, male or female, even in the 1960s. Macnee and Rigg rarely did stunts even in The Avengers. Steadicam car-mounted cameras did not exist in the 1960s, and filming was generally not done on top of cars because the camera would be noticeably bumped around. Thus, the standard practice was to use a mock car set in studio and rear screen film projections in the background. 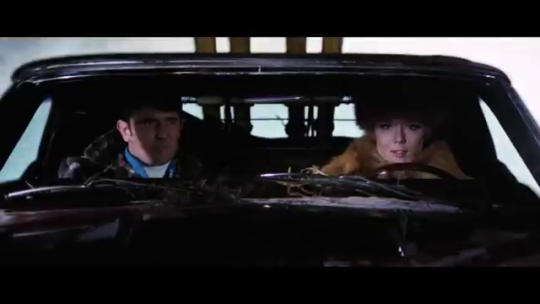 As for the wide shots of the car being driven around on the ice rink, there would have been no point in Diana Rigg driving the car and unnecessarily risking herself when she is not seen inside the car. A stunt driver would have done this. The liability was simply too great to allow non-professional drivers to risk themselves, especially since an injury would mean that filming would cease. If they did in fact allows Dame Diana to do all her driving stunts in that scene then they were taking a very big risk. Another possibility is that a stunt driver was really driving the car while the actor was flailing away at a dummy wheel in the other seat. That technique was used for the film Ronin, though that is a much later film. For the record, it is not at all obvious in the clips in that video that she is driving a real car. The blur of images seen through the rear view window could easily have been accomplished on a studio set with rear screen projection just as I have said. Admittedly, however, I have not seen the complete film in donkey's years, so there may be additional shots that would change my mind. Clearly, you're deliberately being adversarial and making up perceived insults against Diana Rigg that are simply not happening. "Mis-remembering" does not mean lying or making up stuff. I'm not insinuating anything. You are simply putting words in my mouth. And there is no sexism in my statements either. You are inferring something that is simply not there. I'm in my fifth decade and already early memories are starting to drop out the back of my head despite having had a near eidetic memory all my life. The events of On Her Majesty's Secret Service happened almost 50 years ago, and people's memories often conflate various events as they get older. In fact, the very nature of human memory makes this impossible to avoid. 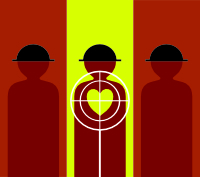 Each time you recall a memory, it is like taking out a file, copying it onto a new file and putting that new file back in the place of the original one, allowing for inadvertent modification of the memory in the process. Clearly, you're deliberately being adversarial and making up perceived insults against Diana Rigg that are simply not happening. "Mis-remembering" does not mean lying or making up stuff. I'm not insinuating anything. You are simply putting words in my mouth. I'm not putting anything into your mouth that you yourself did not say. You were pretty explicit in your dismissal of Dame Diana's claim to have driven that car, and although I understand you didn't intend an insult, I do find that dismissal to be both disrespectful to Dame Diana and sexist nevertheless. If Dame Diana's word about what she actually did isn't enough for you, there is documentation elsewhere that she drove the car herself. She also freely admits that a double did the skiing for her, so why would she be untruthful about having driven the car? And please don't play the age card. It's beyond condescending, especially given that I'm not exactly a whippersnapper myself. You have an extraordinary ability to take everything out of context in order to justify being offended. I will not argue with you any further. Please continue to enjoy the ego juice you're getting from being offended on Ms. Rigg's behalf without any further assistance from me. Thank you for this, Ian. At 2:12 the narrator states: ""The ice chase sequence called for some hair-raising driving by this talented actress." 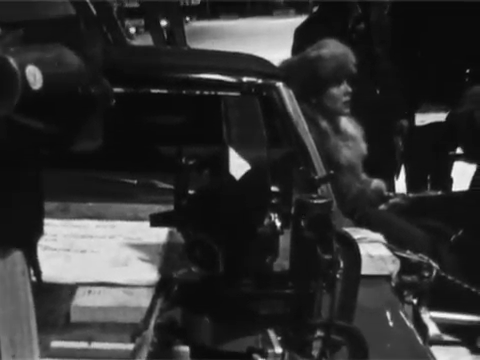 This is accompanied by behind-the-scenes footage of Diana Rigg actually being in the actual car, which she actually drove, on location, and not in a studio. I do think that puts paid to any controversy, yes? Yeah, I went back and looked at the car chase scene in more detail, and there definitely is a mix of studio shots and ones that were done on the ice, and this is how you can tell. So yeah, while some of the in-car shots *were* done in a studio, others were not, and Dame Diana was remembering quite correctly when she said she actually drove the car when they filmed the ice track sequence. Because she did. The book The Essential James Bond (Lee Pfeiffer & Dave Worrall) says that the sequence took over a week to film and used four Mercury Cougars. Today the full list of Winners of the 63rd annual Drama Desk Awards was published in online! Alas, dear Avengers fans, Diana Rigg (in category "Best Featured Actress in a Musical") has not received this award. Winner is Lindsay Mendez, musical Carousel. P.S./ There still have hope for Tony award.